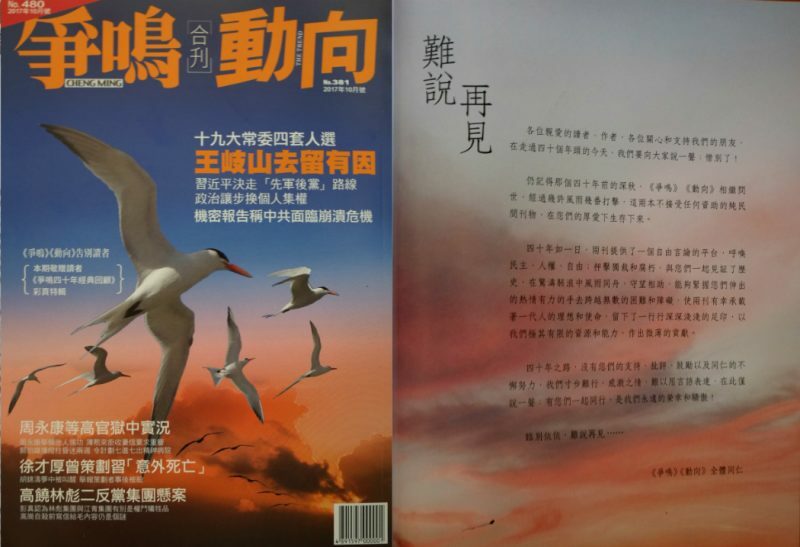 Last issue of Cheng Ming and The Trend. Image from HKFP. This post was written by Kris Cheng and originally published in Hong Kong Free Press on October 3, 2017. The version below is published on Global Voices under a partnership agreement. Hong Kong-based anti-Communist magazine Cheng Ming has announced that it will cease publication after 40 years in print. Its sister magazine The Trend will also disappear from the shelves. 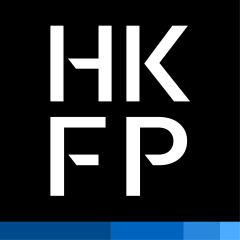 While the decision was related to the recent death of the founder of the two titles, many have commented that the disappearance of magazines critical of the Chinese Communist Party over the past few years signifies the end of Hong Kong's free press. The Cheng Ming monthly was launched on November 1, 1977, whilst The Trend began publishing a year later. The pair released a final joint issue on October 1 that allowed staff members from both magazines to bid farewell to readers. The founder ad publisher of the two magazines, Wen Hui, was born in Guangzhou, China, in 1921 and moved to Hong Kong in the 1940s. He joined the Chinese Communist Party’s underground news agencies in Hong Kong, before being transferred to the Wen Wei Po newspaper. But he was turned away from the party after the Cultural Revolution. The two titles were criticised by the party as “counter-revolutionary,” after an article written by Wen in 1982 criticised Chinese leader Deng Xiaoping. Wen left Hong Kong for the US in 1997. [Farewell to Mr. Wen Hui. Farewell to Cheng Ming] After the end of the Cultural Revolution, in the second year, a group of old publishers who had many links with the Chinese Communist Party established a number of press houses with the consent of the United Front Work Department, Overseas Chinese Affairs Office and Hong Kong and Macau Affairs Office. They played a role liberating people's thought from Maoist influences. However, on March 30, 1979, Deng Xiaoping put forward the idea of “Four Cardinal Principles” [The four principles are: uphold socialist path, dictatorship of the proletariat, leadership of the Communist Party and Marxism-Leninism-Mao Zedong Thought] in the party theory working group meeting. The group of magazines responded with open criticisms. Under huge political pressure, some publishers had to revise their stand openly. Wen Hui remained the only one devoted to the struggle against the “Four Cardinal Principles“. His magazine, Cheng Ming was henceforth labelled as a “counter-revolutionary” publication. I was working for China News and witnessed how the propaganda machine suppressed Cheng Ming. But Cheng Ming's distribution was getting better and better. It managed to sell 80,000 copies per issue. The disappearance of booksellers in Hong Kong [in 2015] struck Hong Kong's publishing sector hard. Moreover, under the Blue/Gold/Yellow Operations [According to Guo Wengui, an exiled Chinese billionaire who claimed to have worked for China's spy network, these operations are designed to exercise control over the business and political sector in overseas Chinese communities], Hong Kong no longer has press freedom, and is no longer a global press center. The timing of the publication of the last issue of Cheng Ming and The Trend right before the 19th CCP National Congress on October 1 […] is related to the passing away of 96-year-old Wen Hui. Here we should salute the old man who held firm to his belief all his life. His speech about struggle with the Four Cardinal Principles till the end of his life will be remembered in history. Citing unnamed sources, Oriental Daily reported that the closure was related to the death of Wen, who passed away aged 96 in New York recently. His family reportedly did not want to carry on publishing the titles, which had been losing money. The three magazines which I had been contributing to for a long time, Open Magazine [ceased to operated in December 2014] , the Trend and Cheng Ming, all have ceased to operate. I wanted to write something but found myself speechless. In an era like this, what can I say?